You are here: Home \ Blog \ Peaceable Healing \ What's your word for 2017? Well, I have had plenty of time to give it some thought since then while holed-up in the house, sick since January 3rd. But, unfortunately, being sick, stuck inside, wasn’t conducive to deciding on my word. It was all I could do to stay awake for a couple hours at a time let alone think of my word. So, I let it go until just a few days ago when I was feeling better. I did a meditation and asked the question, “What is the word I should make my word for 2017?” I received, “Close your eyes, ask the question, and listen to what shows up.” And so I did. . . .
What showed up? PEACE, the word PEACE. I wasn’t really surprised as PEACE has been part of my mission for some time. The word is found in my book title Creating the Peaceable Classroom, which promotes peace within and in the classroom climate, my mission to help young and old adopt mindfulness practices that help to create inner peace, the words Shanti, Shanti, Shanti (Sanskrit for peace) chanted at the end of my yoga classes, my efforts to create peace in the world through expanding the love in my heart and sending it out to others, creating greater peace in the world and suggesting others do the same, and it’s what I wish to be. PEACE is definitely my word for 2017. It’ll be the torch I carry and the light I radiate out into the world as I live my life. What about you? What is your word for 2017? Maybe a word pops right out at you, maybe not. Reflect. Meditate. Choose a word from the list above. Let it come from deep within. Do whatever process works for you to find the word that is right for you this year. You’ll know it when it shows up. It may be something you need to do, to learn, to espouse, to create, to be. Whatever it is, let the word you choose be your torch, your guiding light, your intention for the new year ahead. 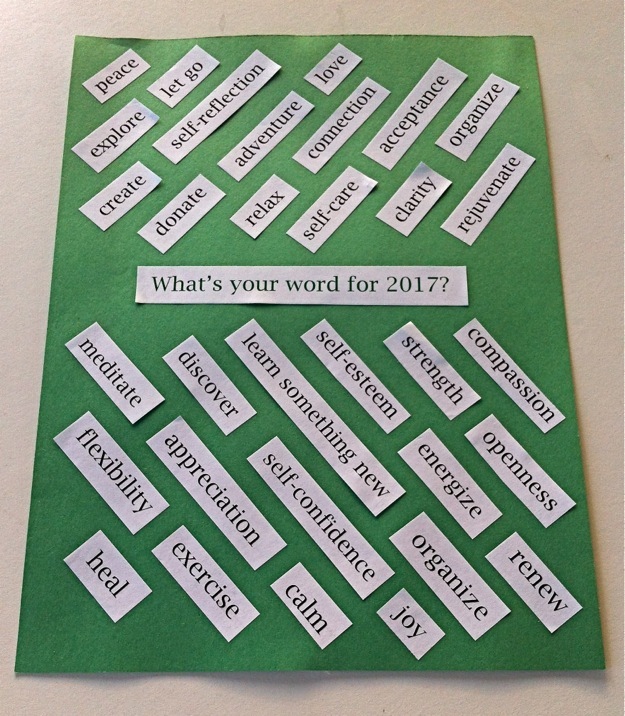 Let’s all move through 2017 with being, doing, becoming our words! Thanks Sandy, Peace does suit you! As I took a breath to settle into the question of my word, I first sighed an “OM” anticipating that was just my preparation, I soon was to discover that it is my 2017 word! May I ever be reminded of the primordial vibration of Om and remain attuned to it as this year unfolds! How nice to be surprised that the sighing of “OM” became your special word for 2017, Jan! Lovely ,,,, Thank you for sharing your special experience. I apologize for such a late response to your reply. Sometimes life intervenes. There’s definately a lot to know about this topic. I really like all the points you have made. I find myself in a calmly spectacular (is that possible?) point in my life. So many issues have sorted themselves out. I want to appreciate every day. By the way, I love this question, no matter what time of year it’s asked! Great, Julie, enjoy the ride, the view, the everything as you take residence there …! OOOPs wrong t reply to your response. I’m glad that you are in a ‘spectacular’ time of your life. Makes me smile. I also agree that this questions is good any time of the year.